Click here to learn which local restaurants buy from area farmers. 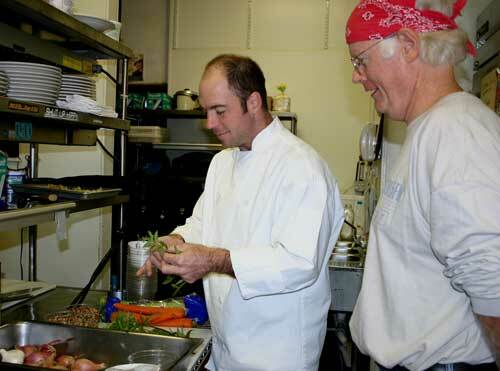 Farmer Bill Dow assembles an order for one of his restaurant clients. Bill started farming over 20 years ago and his Ayrshire Farm in Pittsboro was North Carolina’s first certified organic farm. Sales to restaurants make up a large percentage of business for Ayrshire Farm. Bill sells to about 20 different restaurants and makes deliveries twice a week. 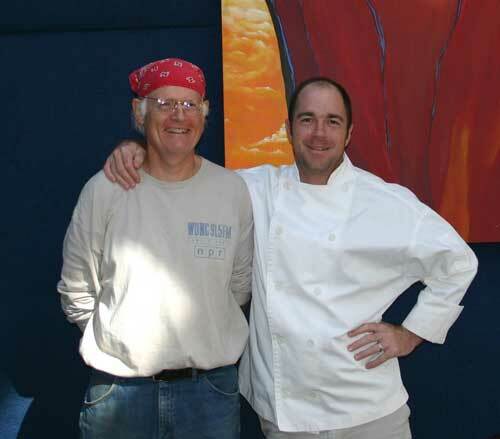 Bill has spent years cultivating relationships with many of the Triangle area’s top chefs. 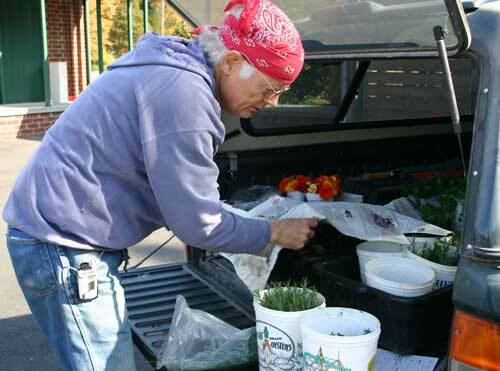 He works with them to determine what to grow for the season and provides a wide variety of vegetables, herbs, and edible flowers. 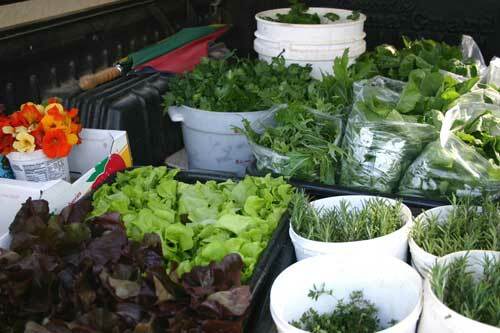 A sample of the day’s offerings includes lettuce, cilantro, rosemary, arugula, nasturtiums, and peppers. Bill sold over 18,000 flowers last year! 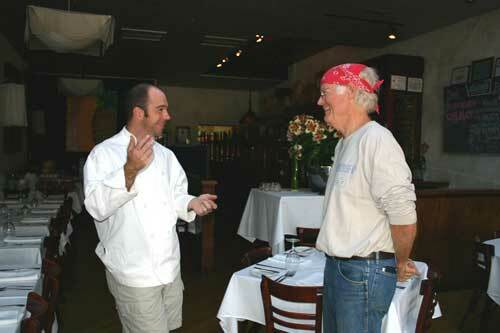 Bill Dow and Chef Proprietor Bret Jennings from Elaine’s on Franklin in Chapel Hill..
Bret Jennings and Bill Dow chat in the dining room of Elaine’s before the restaurant opens for dinner. Bret strips the leaves from the lemon verbena that Bill just delivered. 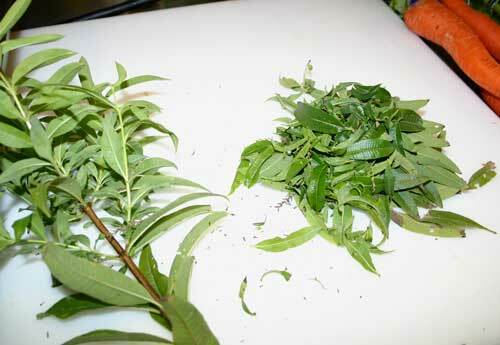 Fresh lemon verbena leaves release a wonderful aroma. 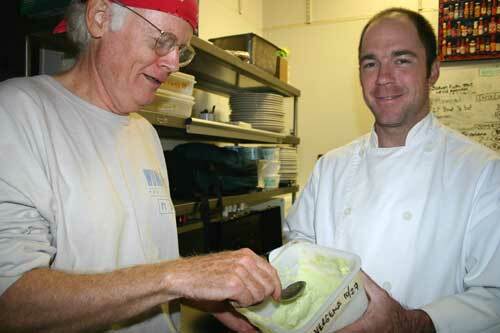 Bill samples the sherbet made from his lemon verbena. 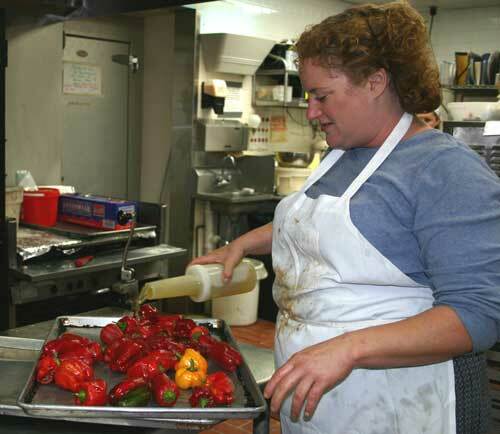 Executive Chef Gwen Higgins at Aurora in Chapel Hill coats sweet bell peppers from Ayrshire Farm with olive oil prior to roasting. Within 5 minutes after Bill delivered the peppers, they were in the oven being roasted for a tomato and pepper soup. Bill has provided Gwen with fresh produce for almost 20 years, ever since Aurora opened! 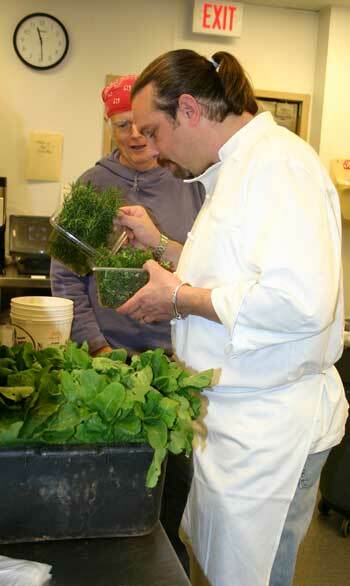 Chef and owner Sam Poley checks out the fresh herbs and arugula Bill just delivered to Restaurant Starlu. Sam has worked at several different restaurants over the years until opening Starlu in 2004, all the while buying from Bill.